The hemispherical chuck is one of the most basic tools you'll need. I find this design to be simple, functional, easy to use and very reliable. 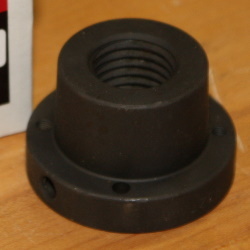 There are a lot of designs for chucks, this one is based on a 2" PVC compression fitting. The threads on it work well and are quick to get the cap on and off. The size of the cap on the 2" fitting does put a slight restriction on its use and you may find that a 2-1/2" or 3" fitting provides more access to the exposed portion of the sphere. I suggest starting with a 2" fitting and see how it works for you. To make the hemispherical chuck, you'll need a few supplies. These should all be readily available. We cary a few of them in our store that you may not find at your local hardware supply. Contact us if you need help. Piece of wood, about 3"x3"x3-1/2". You want a fairly short and compact chuck. This will make is as stable as possible. 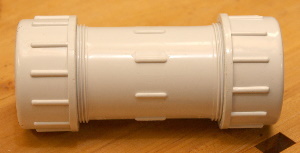 2" PVC coupling, or at least half of one. You may be able to find one in the plumbing supplies section at your local hardware store. Chuck insert, fitted for your spindle. Anything will do, but I recommend the 'Oneway stronghold chuck insert'. It's possible that you could just hold the hemispherical chuck in your 3-jaw chuck, but I recommend against it. Using the insert holds the chuck very securely and allows you to easily convert the chuck to another lathe with a different spindle if needed. Compass or 2-1/2" craft punch. A 2-1/2" craft punch is useful for a few other templates you'll need as well. Piece of thin cardboard or other stiff, thin material to make the circle template. 1 You need a 2-1/2" circle template, and it needs to be as perfect as possible. You can mark one with a compass and cut it out very carefully. 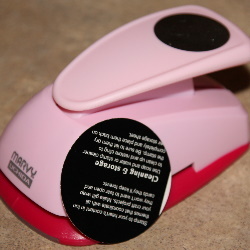 Another option is to use a 2-1/2" circle punch from the craft store. However you make one, it needs to be on fairly thick stock so that it's stiff. I prefer a darker colored material because it makes it easier to see. 2 Discard the rubber insert from the PVC compression fitting. Take off the cap, and cut 2" off the end (not including the cap). It doesn't have to be a perfectly square cut. I suggest using a hack saw. 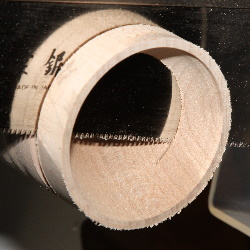 3 Turn your wood into a cylinder about 2-3/4" in diameter. 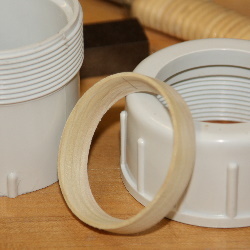 Attach one end to your lathe so that you can hollow into the other end. 4 For the most stable chuck, inset the chuck insert into the wood. Hollow a space into the end of the wood cylinder. 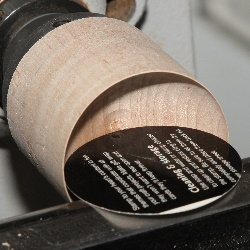 The insert is tapered, so turn a hollow that will be a tight fit. 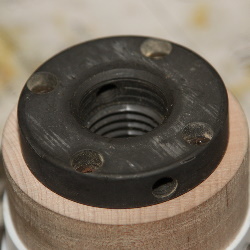 5 Secure the chuck into the base with #6 screws, being mindful of the depth of the screws and their locations. 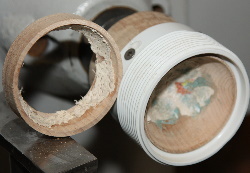 6 Remove the chuck from the lathe, turn it around and screw it on to the spindle with the insert. At this point, you may need to get the chuck body round again. 7 Screw the cap onto the compression fitting. Notice the area about 1/2" tall where the rubber rubber ring was held. We're going to make a collar to fit into this area. 8 Hollow out the end of the chuck to a near-perfect half circle. Use your 2-1/2" template to guide your cutting. 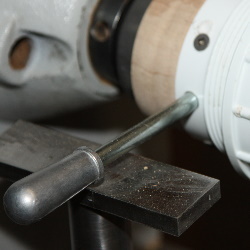 It's helpful to drill a starting hole exactly 1-1/4" to set the depth. Use whatever tool is easiest. 9 Size the outside of the final 1/2" of the chuck to fit the inside of the cap. It needs to fit well so that it doesn't wobble, or break when tightened. But it also needs to be loose enough to turn freely within the cap so that as the chuck is tightened on a ball the ball isn't moved out of alignment. Sand the outside of the collar to a fine grit and rub with wax. 10 Part off the 1/2" collar. Turn it around and ensure that it fits well into the cap. Adjust as necessary. 11 Reset the depth of the chuck body to 1" (I drill a hole that depth). Hollow the chuck again using the template as a guide. Proceed slowly and carefully to match the template as well as possible. 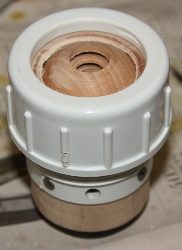 12 Turn the outside of the chuck body to fit the compression fitting body very tightly. It needs to be so tight that the fitting needs to be pressed onto the body. This is very important or the whole thing will be wobbly and move around. 13 Drill 4 holes into the PVC fitting to secure it onto the body. 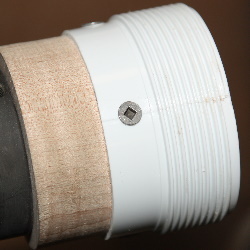 Make sure they are below the bottom of the hemisphere and that they are in between the screws holding the chuck insert. You may want to recess the screws or otherwise ensure that you won't be snagged by them. 14 Press the fitting onto the chuck and secure to the body. I put a board against my tail stock and turn the crank. Carefully set the depth of the fitting so that when a ball is inserted, and the cap tightened, about 1/2 to 2/3 of the fitting's threads are used. 15 Drill another hole into the chuck body. This one shold be about 3/8". 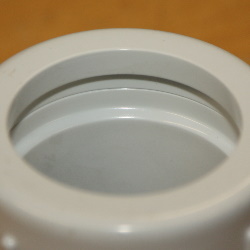 It will be used to hold the chuck still when unscrewing the cap to remove or move a sphere. Use a tommy bar or any strong 3/8" rod for this purpose. I use the one that came with my 3-jaw chuck. 16 Your chuck is now complete! A You want your chuck to be as compact and stable as possible. The outside of the compression fitting may not be very round, but the hemispherical inside of your chuck should be near-perfect. B The inside of my chuck has that sticky blue clay-like stuff called 'blue-tack'. I find that the blue-tack sticks to my balls, so I cover it with a piece of paper towel and it works great. Also, my collar has some of that router-mat material on it to help grab the ball. Your goal is, that as the cap is tightened, and the ball is held against the back of the chuck with the tail stock, the collar and ball stay still. C When using the chuck, you shouldn't have to crank down hard on a ball. The blue- tack and router-mat stuff should hold pretty well. I always tighten enough that I need to use the tommy bar to get it loose, but I've never crushed a ball in the chuck, even when securing for the 12th hole and the ball is at its weakest. D When I'm done working a particular hole and am ready to move on, I slide over my tool rest and insert the tommy bar so that it registers against the tool rest as I unscrew the cap. 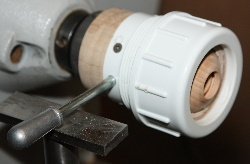 This works very well to loosen the cap without removing the chuck from the spindle. As soon as I loosen the cap, I remove the tommy bar and lock the spindle for when I'm going to tighten the cap for the next hole. Just be sure to unlock the spindle before turning on the lathe.